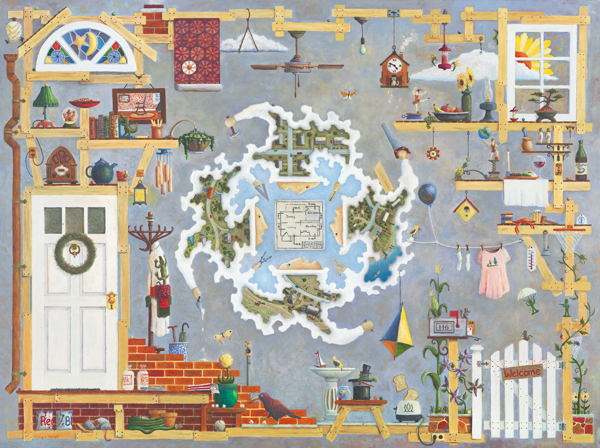 Shown is “The House That Jack Built” Painting which includes a menagerie of items that were suggested by many online followers to this audience participation art project. A Thank you to all those that were able to attend the opening. A Thank you to all those, that both helped with set up and for providing various foods. A Special Thank you to a good friend Mac who helped me patch nail holes, sand walls , paint out the room, and hang artwork for the Art display and to Karen for her ‘over the shoulder help’ with art technical questions and guidance. A Thank you to the Staff at Ukazoo for all their assistance. A very heartfelt Thank you to all the Facebook, WordPress Blog, and LinkedIn friends and acquaintances that made suggestions, comments, Shared Posts, and gave encouragement along the way. As promised at the very beginning of this art project, I would pull a name (of those that made suggestions) from a hat at the Opening and give away the first signed and numbered print of “The House That Jack Built”. The winner was Karen Trimble.